I guess this could just as well have been posted in the trackplan section, but as it is a module, it's more fitting to reside in the modular topics section. Here's my module 'Wolter Springs', currently under construction. 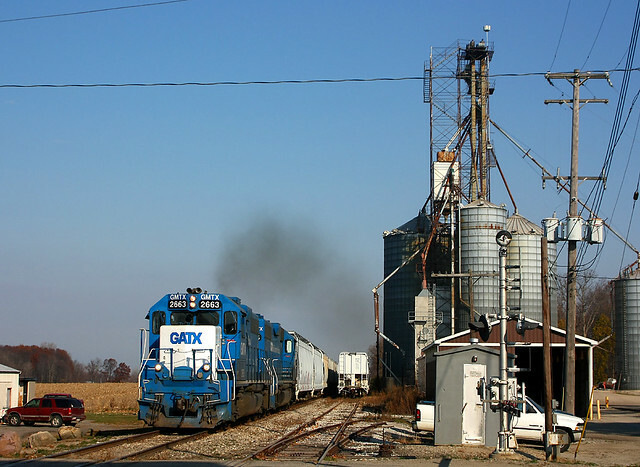 It represents a small yard and depot along an SP branch line in California, where some commuter trains might stop (SP Bi-level commuter cars are on order ) and there's a few small industries so I can do some switching when the module is at home and attach a few lead tracks on either side. I haven't decided yet on the SP station building, but probably a type 22 or 23 depot building. I've named an industry after his place of residence, and the module is named after my father, who passed away this summer after a short battle with cancer. Those reasons give me enough motivation to see this project through. Looking forward to seeing your designs too. Here's a little progress on the module. Today I've made a set of legs and 'elevated' one of the two boards to a 40"+ height. I still need to fit the legs with adjustable feet for uneven floors and be able to raise the rail head to the 45" standard of NMRA-BR draft spec. The other board is on the floor behind it. It has a basic scenery cover which was a plaster mix, with a few drops of earth brown latex paint dye added, but it's too light for my liking and will get another darker top coat. Inspired by last weekend's modular meet at Broadclyst, I decided to do some work on my module boards. Today I made a second set of legs for my second board, that together make up my Wolter Springs module. Here the are the pair of boards, on legs and test fitted for the first time in my dining room. (much more comfortable temperature than in the shed I made them in...). I still need to make slots on the bottom of each board to guide the legs better and set them to the right height easier, and then drill the holes in the head boards to that I can guide them together with dowels or a bolt and wing nuts, but it gives me a good impression on where it's going at this moment, and it's starting to come together. This evening, I made another push in the construction of my boards and legs, and made 2 sets of leg 'pockets', which will be fitted to the inside of my boards, in which the legs will slot. I've also fitted tee nuts and bolts to the legs for height adjustment. I will probably hot glue bottle caps to these bolts for a bit more protection against scratches etc. Definitely put something on the adjusting bolts. I use bottle tops. Not only do they protect the floor they also make it easier to turn the bolts. Today so far, I've made a shelf and attached that to the bottom of one of the boards. On this I am planning to mount my DCC system and power supply. Here you can see my Lenz command station, which I received today, test fitted on it. I've also cut extra pieces of plywood and glued these to the inside of both head ends of each board. This is to re-enforce these against flexing, and make them stronger. These are the surfaces that will join with other boards, and will also be the ones that get clamped etc, so I decided to re-enforce these while I am still in 'carpentry mode'. To finish off later on I fitted the now completed legs and pockets to the other board, and joined them together, and set them sort of level using my 'mark I eyeball'. 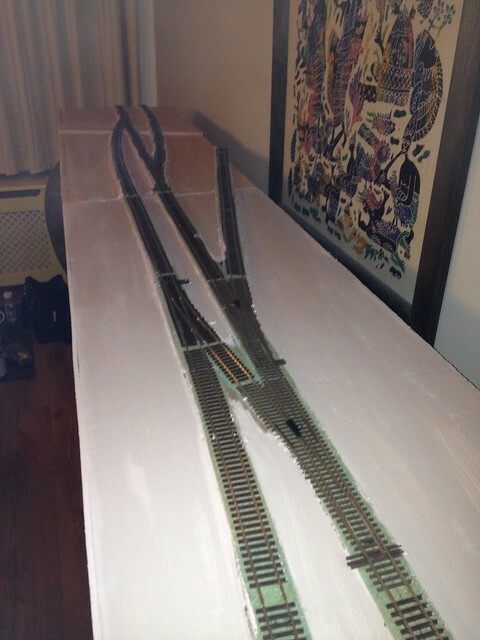 I will get a spirit level out tomorrow to set the boards properly, and then will fine tune the track transitions before installing these permanently. 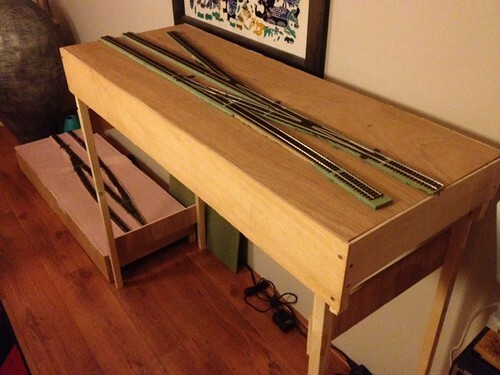 Then the real fun can begin, wiring, running a train, and then scenery! Another hour or so work today , straight after work, saw the dropper wires soldered to the main tracks, and onto a temporary bus wire. 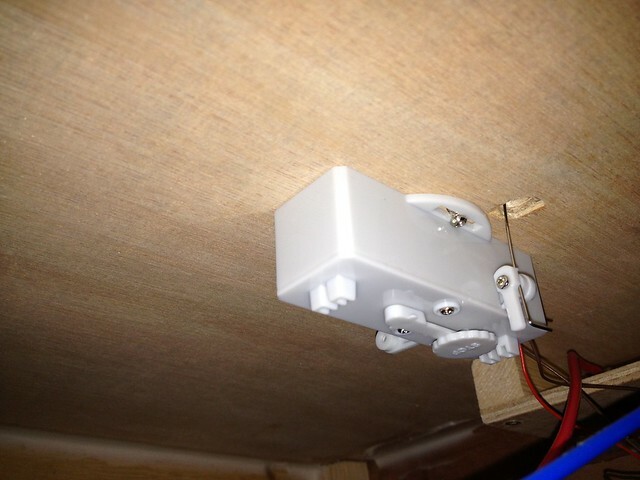 (I am still waiting for some material to install the banana sockets etc, once I have those I can make a permanent track bus wire install), and connected it to my Lenz system, which all worked first time round, no mistakes etc. As the proof is in the pudding (or in the track voltage), here is my SP GP35, which, after another 20 minutes or so, was equipped with a Lenz Gold decoder so I can do some switching (this loco will get sound in the future at some point). For lack of champagne, I decided to mark the occasion with a glass of cheap red wine. Really great progress Koos, always a nice feeling to see the first run! Today I painted on a first coat of latex paint in a light sand/earth tone, the colour isn't that clear in the picture due to dim ambient light and a weak flash on my phone, but it looks better in reality. I will paint one more coat with the same, and sprinkle in some ground foam in places just to get rid of that plain painted shelf with track look. I will carefully pencil in some of the other roads, platforms structures and other contours, and then start working on those, but all that will have to wait till next week. I have some wiring to finish first. I've received my turnout motors, and installed the first one. They are supplied by Conrad Electronics, a German electronics retailer similar to Maplin in the UK. They also have a UK webshop, and you can order these motors in packs of 3 for very cheap. The link is www.conrad-uk.com . 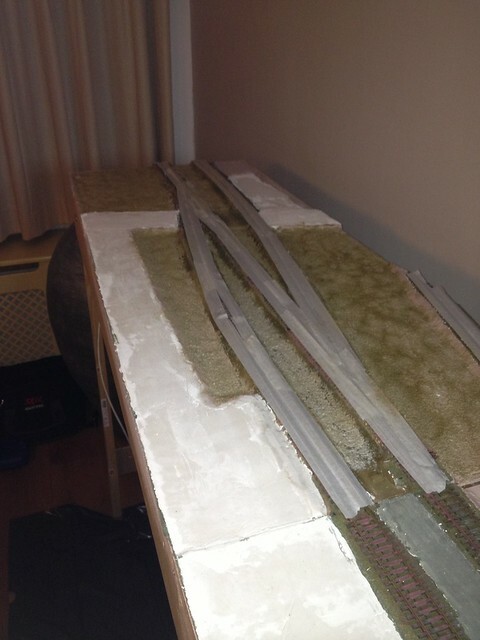 Have a look under the modelrailway section and look at track accessories. 3 drives cost £13,99. These are motorised drives, so not coil driven like a SEEP. However they are not slow-motion drives, these switch within 0.5 seconds, but switch off at the end of the throw so you don't get any 'sound effects' such as hum etc. They also do not have an extra switch to control the polarity of the frog, however the actuating lever is protruding at both sides of the housing, allowing for left or right hand side mounting. The unused side could easily be used to actuate a micro switch installed next to the drive, for that purpose, and that's what I am planning to do in due course. I don't know much about the reliability of these, so time will tell, but for the money I thought it was worth a try. Slowly moving forward, I've now applied the first layer of Woodland scenics blended turf T50 earth, as part of the 'sub scenery'. It will be followed in due course by applications of other shades and textures such as grass tufts, clump foliage, static grass etc, where applicable. 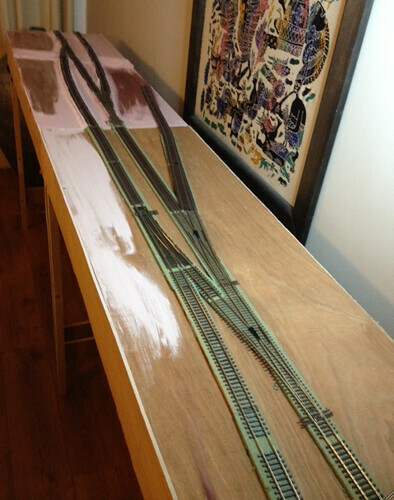 The outline of the road has also been applied with a layer of plaster, and will need a bit of sanding down here and there before painting, but before I do that I need to install the guard rails at the level crossing, and apply the plaster mix there to create the crossing. 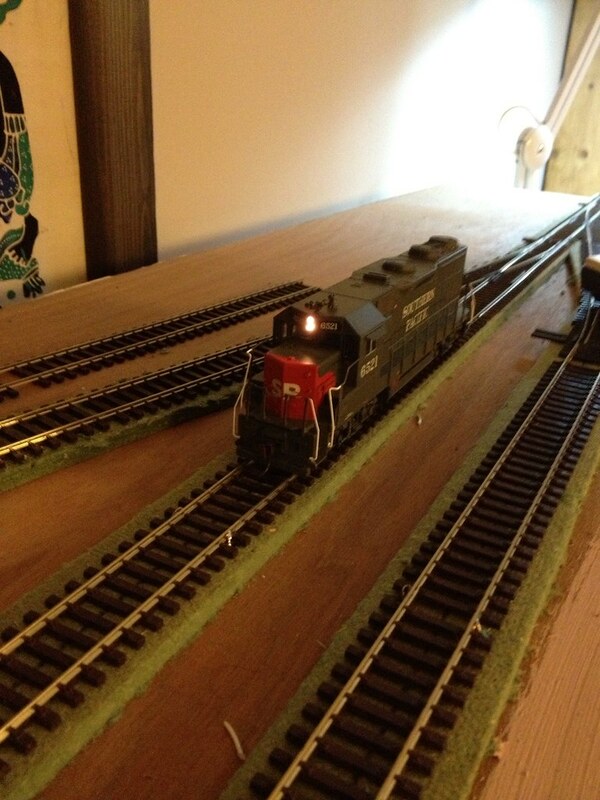 I've now applied some ballast, it's amazing how this transforms the otherwise bare module. I still have lots to do, but thought I'd share this picture. torikoos wrote: I've now applied some ballast, it's amazing how this transforms the otherwise bare module. As you say, it makes a huge difference. Towards the other side of the module a small industry is starting to emerge. 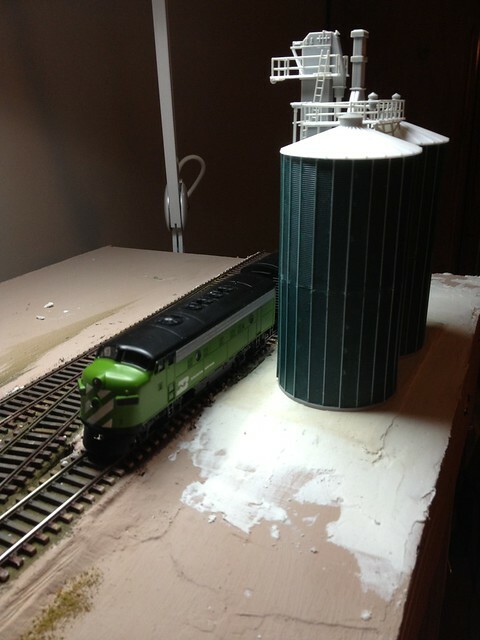 Here's a silo kit that I built. It's a Faller model that is probably a german / european prototype, but I think it works fine and can easily be 'americanised. I am not too happy about some of the fit and finish though despite a lot of sanding, I still have a few gaps here and there so that needs to be patched with putty, and it also needs painting, partly to disguise the coarse parts like handrails etc (but that's okay for a model that will be picked up regularly for modular use), and the plastic shine. 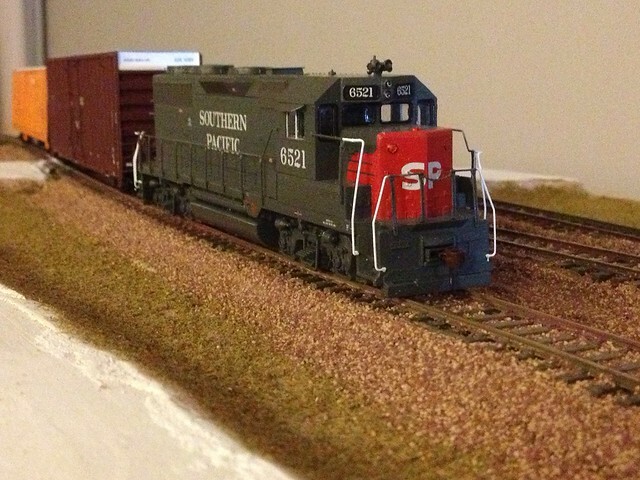 I still have some detail parts sitting around, so I will have a go on working on this loco in the near future. Will also order the Kadee coupler sets to bring the distance between A+B unit closer together. A quick blast of silver, then some rusty streaks and you're sorted.